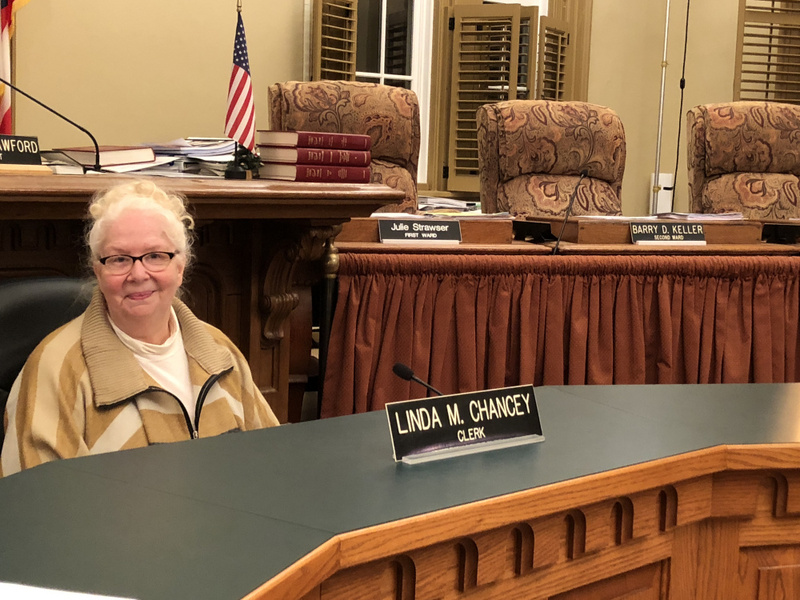 CIRCLEVILLE – City Council will meet tonight March 5, 2019 No legislation is scheduled for first, second or third reading. Reports from City officials will be heard and any new business or addresses to council will be heard. Should be a short meeting A finance committee meeting will start afterwards at approx. 7:15 pm to discuss several important ordinances. An Ordinance Authorizing And Directing The Mayor To Enter Into And Executing A Membership Agreement On Behalf Of The City Of Circleville With The Ohio Plan Risk Management For The Purposed Of Property And Casualty Coverage Through The Ohio Plan Risk Management And Declaring An Emergency. 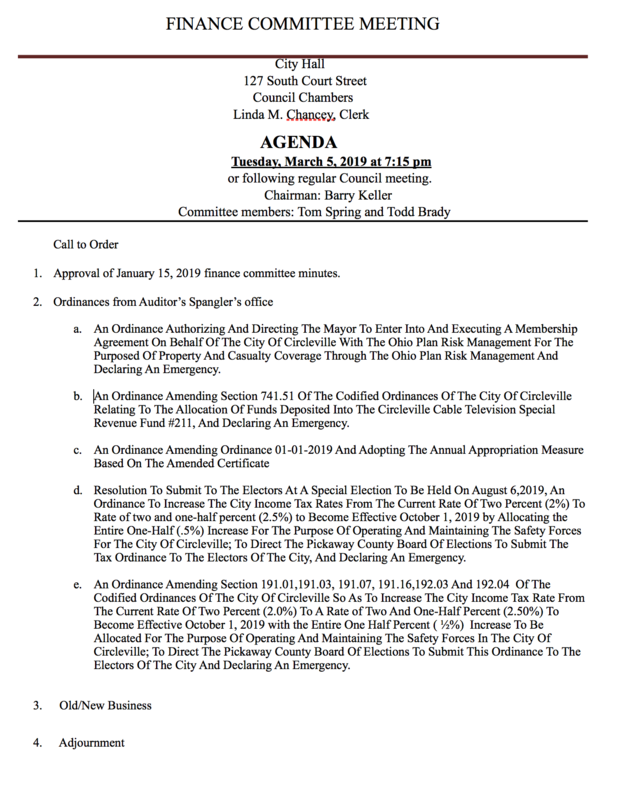 An Ordinance Amending Section 741.51 Of The Codified Ordinances Of The City Of Circleville Relating To The Allocation Of Funds Deposited Into The Circleville Cable Television Special Revenue Fund #211, And Declaring An Emergency. Resolution To Submit To The Electors At A Special Election To Be Held On August 6,2019, An Ordinance To Increase The City Income Tax Rates From The Current Rate Of Two Percent (2%) To Rate of two and one-half percent (2.5%) to Become Effective October 1, 2019 by Allocating the Entire One-Half (.5%) Increase For The Purpose Of Operating And Maintaining The Safety Forces For The City Of Circleville; To Direct The Pickaway County Board Of Elections To Submit The Tax Ordinance To The Electors Of The City, And Declaring An Emergency. 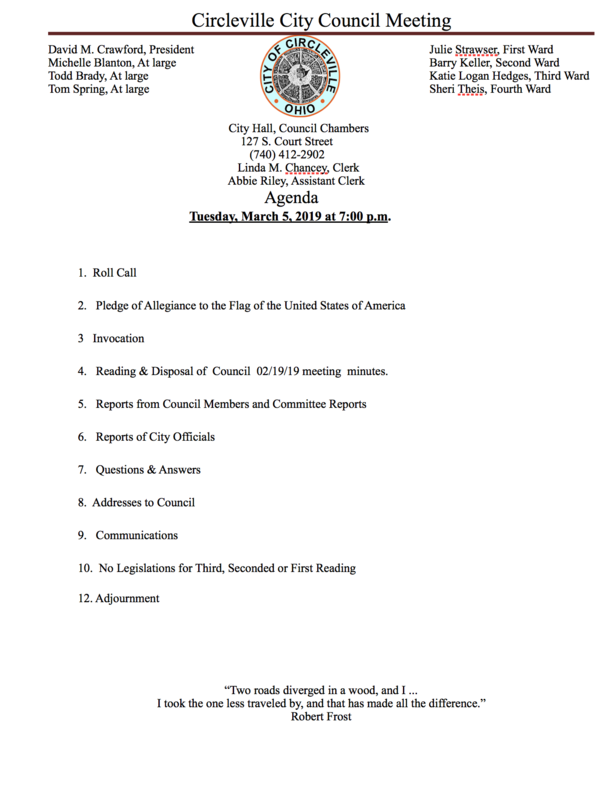 An Ordinance Amending Section 191.01,191.03, 191.07, 191.16,192.03 And 192.04 Of The Codified Ordinances Of The City Of Circleville So As To Increase The City Income Tax Rate From The Current Rate Of Two Percent (2.0%) To A Rate of Two And One-Half Percent (2.50%) To Become Effective October 1, 2019 with the Entire One Half Percent ( ½%) Increase To Be Allocated For The Purpose Of Operating And Maintaining The Safety Forces In The City Of Circleville; To Direct The Pickaway County Board Of Elections To Submit This Ordinance To The Electors Of The City And Declaring An Emergency. Discussions tonight will mostly be on if we need to increase Income tax rates to support the safety forces of Circleville. This should be a interesting meeting. I will have a report on this meeting tomorrow.